Since the adoption of the 2030 Agenda for Sustainable Development in 2016, scientist have been studying its “indivisible whole” nature, with the objectives to propose viable methods and tools for integrated planning of the implementation of the 17 SDGs. The three dimensions of sustainable development as outlined by the 2030 Agenda—economic prosperity, social justice and environmental protection—are viewed as “intertwined”, like three strands of the DNA. The 17 SDGs have a clear starting point in one of the three dimensions of sustainable development and embed all three dimensions within their targets. This publication highlights how the systems thinking approach applied by ESCAP complements tools created by experts as the most comprehensive method to develop strategies and plans for the integrated and holistic implementation of the 2030 Agenda and the SDGs. This short overview of the analytical framework developed by ESCAP describes how the many interlinkages and relationships were analysed (in three selected country case studies) using the systems thinking approach of causal loop interactions combined with the theory of leverage points to identify effective and impactful interventions at the policy level. •	stakeholder mapping and engagement in collectively developing the aspirational qualitative vision for societal change. 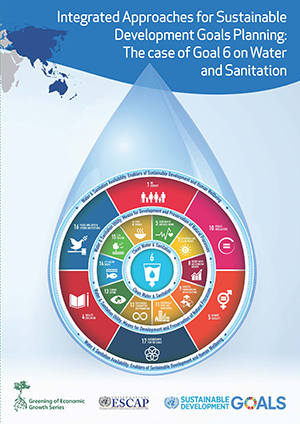 The systems thinking approach applied beyond the integration of SDG 6 on water and sanitation has proven particularly conducive to strengthening and enhancing the capacity of policymakers for adaptive governance to better address the complex challenges of the 2030 Agenda and the SDGs. ESCAP will continue to provide technical and advisory services, tools and methodologies to policymakers in the region to build up their capacity for the integrated implementation of the three dimensions of sustainable development.